Here’s a great recipe using some of the fresh vegetables available these days! Nothing like the taste of roasted corn and fresh heirloom tomatoes to scream SUMMER! In a glass mixing boil, whisk together the vinegar and garlic. Add the oil in a thin stream, whisking constantly to incorporate, then add the basil. Season with salt and pepper to taste. Fill a large bowl with water. Mix in 1 tsp sea salt. Add the corn and soak for 1 hour. Prepare your barbecue or gas grill (medium-high heat). Drain the corn. Grill the corn in the husks until the outside is very charred and the corn kernels are tender, turning occasionally, about 25 minutes. Cool the corn. Remove the husks and cut the kernels off the cobs into a large bowl. Add the tomatoes. Toss with enough vinaigrette to coat. Season with salt and pepper. 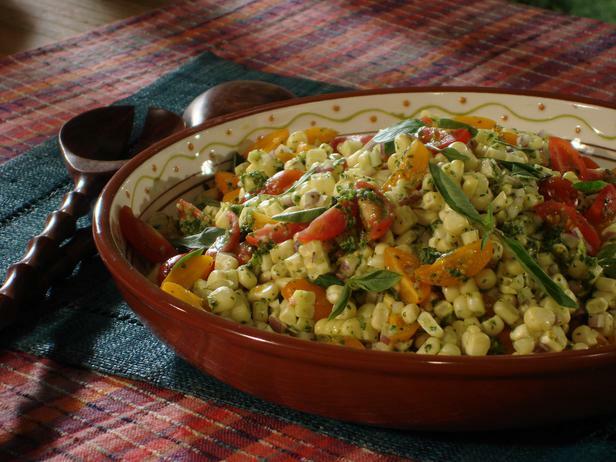 This entry was posted in Salad and tagged basil, corn, garlic, grilled corn, heirloom, husk, tomatoes, vinegar by quarlj01. Bookmark the permalink.